Like the preceding sixties, the seventies was a diverse decade for hairstyles. New styles were being created throughout the decade. 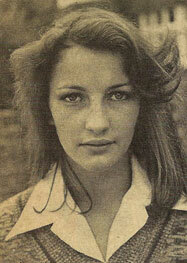 There was a lot of experimentation and hair was sometimes a direct expression of the times. Women’s 1970s hairstyles varied from long, soft and feminine to short, edgy and androgynous. Here we take a look at what and who influenced 1970s hairstyling, and review the most popular styles worn by women throughout the decade. Films and its stars were as influential as ever on fashion. Liza Minelli’s short feathered cut in Cabaret (1972) and Jane Fonda’s androgynous shag hairstyle in Klute (1971) could be seen in various forms throughout the decade. Farrah Fawcett-Majors was one massive influence on mid-1970s hair. Ah, the lovely Farrah hit our screens in 1976 courtesy of Charlie’s Angels. With her long feather cut and big flicked hair, Farrah was the poster girl of many a teen’s bedroom – and the Dads didn’t mind a jot! Nostalgia was big in the ’70s, leading to a whimsical look back to various periods, especially the 1920s through to 1950s. This looking to the past can be seen in fashion, TV shows and films, and music. Several films were set during this era, including The Boy Friend (1971) with Twiggy and The Great Gatsby (1974) with Mia Farrow, which kept the evergreen bob in fashion. Nostalgia wasn’t always an accurate look back. For example, Olivia Newton John‘s final “Sandy” hairdo in Grease, that big mass of bubbly curls, was more 1970s than an accurate style from the ’50s, the era the film was set in. Music and fashion continued to hold hands. The ’70s sounds of glam rock, disco, funk, northern soul, new wave and punk each had their signature looks and style. Punks were out to shock with cropped hair, shaved heads and crazy-coloured sculptures, such as Mohicans, horns and spikes. Hairdressers created a few styles during the decade that were copied by many and some can still be seen today, albeit with modern twists. 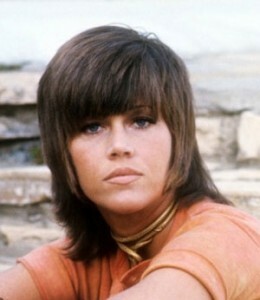 The shag, as seen on Jane Fonda in Klute, is credited to one-time hairdresser Paul McGregor. British hairdresser Trevor Sorbie created the wedge in 1974, a short, layered and angular style, and Jheri Redding created the Jheri curl, a loose glossy hairstyle worn predominantly by African Americans. Long hair had been in vogue since the late 1960s and it’s popularity continued right through the 1970s. It is a very commonly seen style in photographs, especially with younger women. Really straight hair that was parted in the centre was a popular way to wear long hair, as seen on actresses Ali MacGraw in the movie Love Story (1970) and Peggy Lipton in hit TV series Mod Squad (1968-1973). A popular style with UK schoolgirls was straight hair enhanced with a flicked fringe, also known as “wings“, but more on these later. To get hair really straight it could be ironed under a brown paper bag, but luckily there was a new breed of styler available – essentially a hairdryer with various attachments that could be used to create a myriad of styles. More on those below. An early ’70s style that consisted of shorter hair on top combined with longer hair at the back, and lots of layering throughout the hair. The hair could be straight or curly, but always had a shaggy look to it. 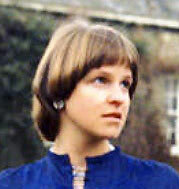 Hairdresser Paul McGregor is credited as having created the shag haircut for Jane Fonda’s character Bree Daniels (as pictured) in the film Klute (1971). It is a unisex, no frills cut that involved evenly-progressing layers with graduated sides and a full fringe. A much longer version of the shag, often with waves, was called the gypsy cut. It was a popular ’70s hairstyle for both sexes and was worn by many including Joan Jett, David Cassidy and Gillian Blake (from a UK TV show for children called Follyfoot). The wedge was created by Vidal Sassoon protégé Trevor Sorbie in 1974. Consisting of short hair with steep-angled layers cut all around the sides and back, creating a triangular shape that was longer on top, going into a heavily-layered aspect at the back and sides with lots of movement. 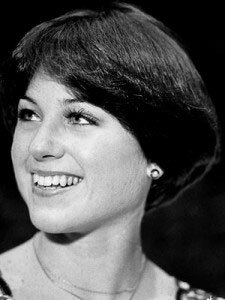 One famous wearer of a wedge was American figure skater Dorothy Hamill (pictured). In 1976, she won a gold at the Winter Olympics and women across America wanted a haircut just like the sweetheart of skating. 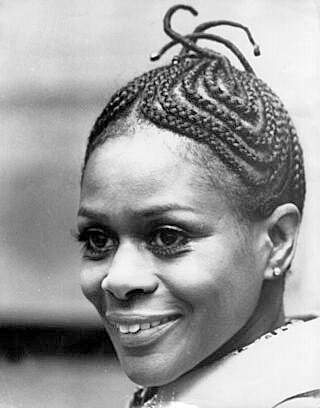 Hairstyles that encouraged the black community to embrace their natural hair structure, as opposed to being “society correct” with straightened hair, continued to be popular in the 1970s after emerging in the ’60s, predominantly as part of the black pride movement. The ’70s Afro was as much about being fashionable as it was politics, and was worn by both sexes throughout the decade, largely by African-Americans and the black community. It was also worn by other ethnic groups and people with very curly hair as an alternative to the uniform long, straight hair. Perming allowed European hair to be tightly curled and from the mid-’70s to the end of the decade, the Afro was worn by various people (men and women) including the famous e.g. Barbra Streisand and Bette Midler. The hair is plaited tight to the scalp, either in straight rows (hence the name) or intricate patterns. It’s a style that requires no relaxers or other harsh chemicals. The ends can be secured with elastic bands and/or decorated with beads. An ancient and traditional way of styling hair in Africa and for African-descended people worldwide, cornrows became fashionable again in the ’60s and ’70s due to the black pride movement. Cornrows also became somewhat popular in the white community when bikini-clad beauty Bo Derek wore long braided hair, decorated with beads in the 1979 film 10. Not all black women had cornrows or an Afro – wigs were still a popular alternative, found in a variety of short and long fashionable styles. 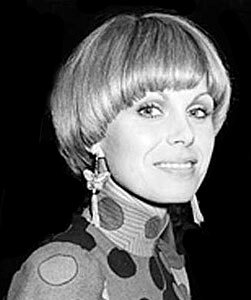 British actress Joanna Lumley (pictured left) wore this bowl-like version of a pageboy in her role as Purdey for TV show The New Avengers (1976-77). Hence it was known, in the UK at least, as a “Purdey”. The popular sleek, rounded hairstyle was also worn on slightly longer hair, known as a pageboy – just as it had been in the previous two decades. Flicks were seen on both short and long hairstyles. They emerged in the early ’70s before Charlie’s Angels (1976) brought the ultimate flicked hair to our attention in the shape of Farrah Fawcett and her “Farrah flicks”. Flicks on a fringe (often centre-parted) were referred to as “wings” due to the shape made by the flicks at the side of the face. Flicks could also go all the way round the bottom of shorter hair, creating a mass of body. The crown area and top of the hair was always straight. To create a splendid flick, the new breed of heated styling tools were used, as well as rollers or tongs. Some women opted for a perm to create the curl needed, which could then be styled really easily. Perms were used to create the lift and shape needed to curl and flick the hair. A high fashion look in the late 1970s was to wear longer hair dressed to one side, often in a pony tail, The pony could be either high up by the top of the ear – or low down at jaw level or even lower on the shoulder. 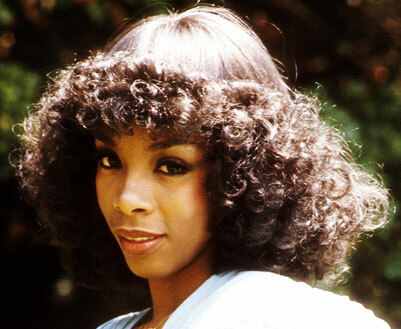 Donna Summer wearing the stack permed look (in wig form) of the late ’70s. Always glamorous and on trend. Perming became more popular later in the decade, from tight curls to more bubble-like creations. One perm that was so 1970s was the stack perm. A stack perm involved perming the middle and lower parts of long hair in lots of small perm rods that were then stacked away from the head and crown area on things like chopsticks. It resulted in a mass of tight, smallish curls around the ends and length of the hair while remaining straight on top around the crown area – creating a halo of curls! While not worn by the masses, punk has its rightful place in ’70s hair history. 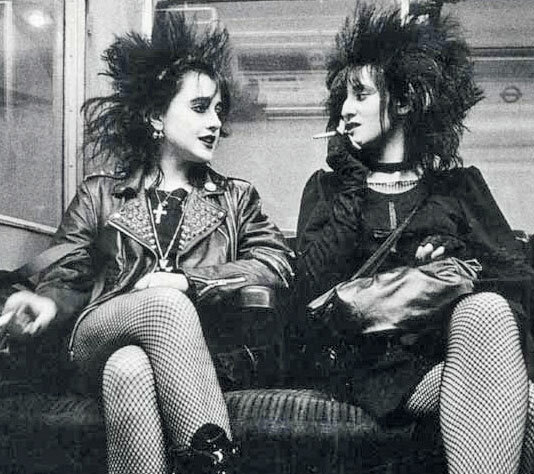 Generally short, spiked and unkempt, punk hairstyles were the opposite of long “hippie hair” and was a look created by the younger generation. Clippering or shaving areas of the head was incorporated into some designs, like mohicans and horns, or wearers went for a full-on skinhead (a revival of a fifties style), though girls often left a fringe and side sections longer. Mohicans were fixed upright, defying gravity, by using everyday household products like eggs, sugar water, soap or gelatine, as well as gels and hairsprays. Punk brought bright coloured hair to the street and anything went, from a rainbow of colour to jet black or bleached blonde. Colours were created using Crazy Color, a range of neon colours in a tub launched in 1977, as well as everyday products like food colourings and even Kool-Aid and Kia-Ora. Punk hair didn’t stop at colour, text and patterns were also put into hair, like leopard print. You could also opt for jet black hair (like Siouxsie Sioux), or the other end of the scale with bleaching hair white blonde (like Debbie Harry from Blondie). The use of hair colour had grown over the decades. By the 1970s, around a third of American women coloured their hair, either at home or via a salon. 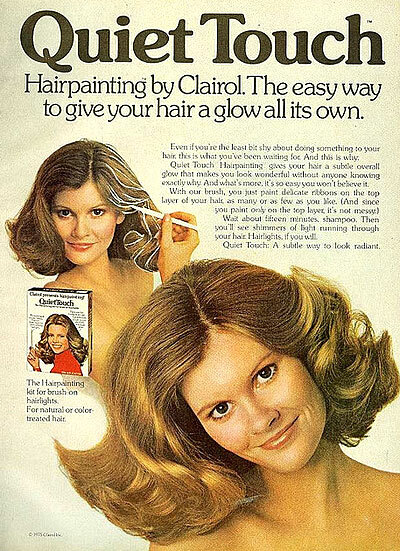 Home dyes were big business, even techniques like highlighting were available to do at home with kits like Clairol’s Quiet Touch (pictured). Highlighting was popular, and could be achieved by several techniques, including using a tail comb to weave the hair onto foils – a recent development in hairdressing technique. A heated double-sided flat iron could then be used on the foil packets to speed up the activation time. Frosting was used to create a natural sun-kissed highlighted look on brown and blonde hair, created by either simply painting on the highlighter using a narrow brush, or by using a few foils. Concerns over the ingredients used in hair colours and links to cancer emerged in the seventies. Colours that were more “natural”, using vegetable dyes as opposed to coal tar dyes, were introduced to the market. Revlon had Colorsilk, the first hair colour without ammonia, and the all natural henna was being used more in the Western world, especially as red tints were popular. Flicks, wings and curls, as well as straightening wavy hair, needed the right hair tools, and hair tool brands were branching out from the simple curling iron or blow dryer to answer the hairstyling needs of the decade. 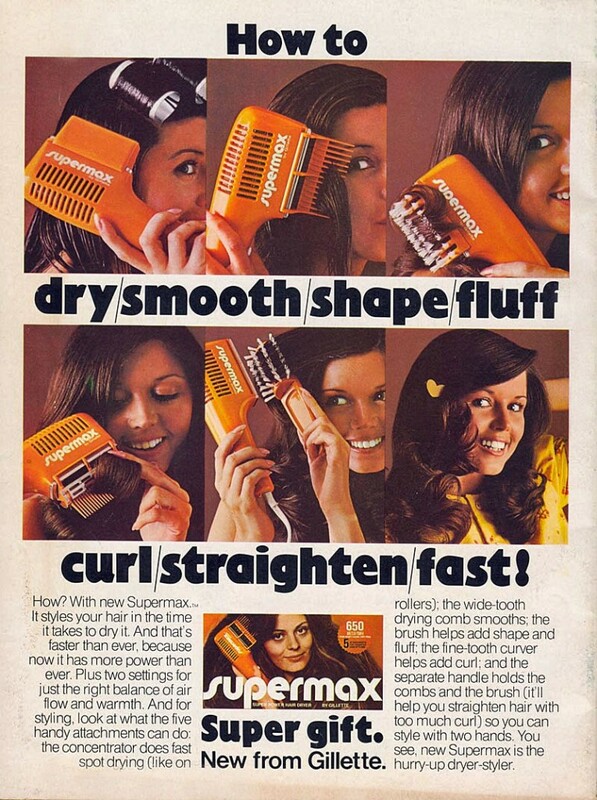 Multi-purpose hairdryers could do it all, including the super orange Supermax made by Gillette. It came with various comb and brush attachments to create all those ’70s styles. Perming was used throughout the decade, mainly to enable various looks to be easily styled. Perms included everything from a root perm in short hair to create lift, the curl needed to flick hair, and soft bouncy curls on longer hair. 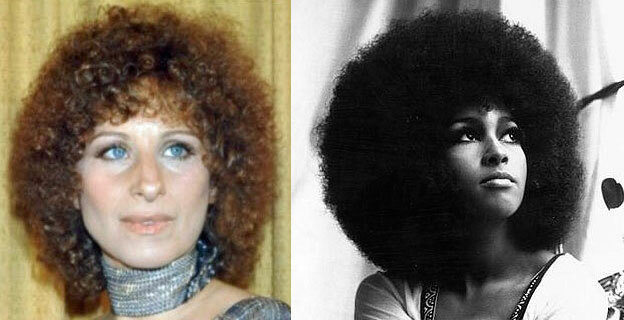 Perms also created the tight, frizzy curls on European hair for an Afro look. The variety and number of hair care products in the ’70s increased dramatically, and there was something for all hairstyles and hair types. The number of shampoo products available also increased tremendously in the ’70s, and products were now targeted at specific hair types (e.g. oily, dry, fine, Afro) or conditions (e.g. brittle, split ends). There was often an emphasis on “natural“, e.g. Clairol’s Herbal Essences (founded 1972). The two-step process of using a shampoo then a separate conditioner also increased during the decade. 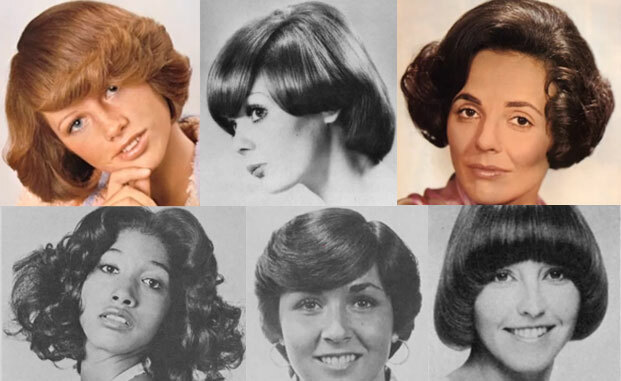 A selection of ’70s styles from magazines: Flicks (1975); Pageboy-influenced (1973); Something for the older woman (1973); Mid-length soft curls (1975); Short and flicked (1976); A sleek pageboy style (1973).